In the last few weeks I've ignored the blog, because I've been working on a permaculture garden design for my friends J-P and Kate. I completed my Certificate in Permaculture Design back in 2010. I undertook a couple of small commissions when I was in Oxford, under the name of Oxford Sow & Grow, including a friend's courtyard garden in London, and of course designed my back garden over the course of 2013. But haven't done anything since. When our friends Kate & J-P moved to Sheffield back in October last year (part of our cunning plan to get all our friends from Oxon to move to Sheffield! ), I offered to do a design for them, in particular, J-P, who is the keen gardener. In a swap of skills, I'm creating a design for their urban rear garden, and J-P is working in my garden a couple hours a month, helping me keep up whilst ill with ME. So after working on this for the last few weeks, I presented my design to J-P and Kate on the weekend, and here it is. 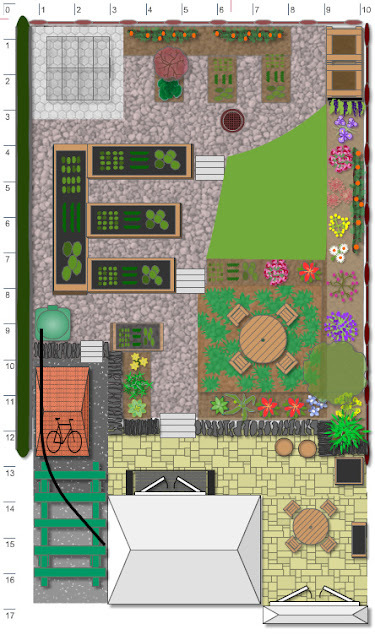 I've used the Shoot Gardening planner to plot out the design*. I'm going to be writing up a proper case study in the future, so I won't go into a lot of detail now. In brief, their East-facing garden is currently dominated by a large unmanageable apple tree that isn't that healthy, and large (thick & tall) privet hedges all the way around. This makes their garden feel small, dark and enclosed. As it isn't landscaped properly going up a steep slope, it's barely useful as is. Kate & J-P wanted a space that was allowed in more light and colour in which they could socialise, with a kitchen garden area for growing some of their own food, and a space to store their bicycles and gardening tools. The space I have designed allows for the removing the privet hedges on 2 sides (the 3rd is a neighbours so it cannot be touched), and the large apple tree, and for then it to be properly landscaped into terraces, with social spaces, a kitchen garden area with a greenhouse on the south side of the garden, as well as composting, water collection, and the addition of new apple tree cordons along the back fence. I've been able to work on the design around my health, and I've rediscovered how much I love working on designs and helping people see the potential in their garden, and empower them to make their garden their own. J-P and Kate seem pretty happy with the design, and it's encouraged me to quietly start up Sheffield Sow & Grow, with the aim to eventually be able to make hopefully a small income out of it. Quietly because of the need to manage my health/ME comes first, I'm not particularly trying to find clients at the moment. If any come by, that's nice. So this is what I've been up to in the last few weeks. It's been fun, and I look forward to seeing J-P and Kate implement the design when they are ready. *I'm not trying to be a formal garden designer, rather a permaculture designer with the aim that I help people realise the potential of their garden spaces, and empower them to feel confident to implement the work as and when it suits them. This is just a quick note from one of Julieanne's two customers named above, to say how great it's been having her research and implement this design. Although I've always had several ideas of what to do with the garden, anyone can have ideas (and there's no guarantee they're any good!) So it's been great having a permaculture designer bring those ideas together, and show how they can work within a coherent system, minimizing friction and maximizing use and enjoyment. The focus on social areas, shows that there's more than enough room within permaculture principles for actually having fun! Julieanne's designs have taken our original brief, and responded to it with both an inspiration, and also a how-to manual, for how we can put together our future garden. This design has completely changed the way I see the garden. I already had thoughts and ideas, but I was quite narrowly focused on responding to what was already there - keep the acer, get rid of the decking and so on. The design made me realise that the garden has so much more potential. Just looking at how light and colourful it could be was a real mood-lifter. What I love about the design is that it's full of new, creative ideas and yet it's all about using the garden's existing resources as much as possible. You seem to have created a wonderful space for JP and Kate Julieanne and I can see from their comments they are very pleased with your take on their brief. You are a talented lady that's for sure. How exciting, good luck with your new venture Angie, I hope you continue to find you can gently develop your business without the ME getting in the way.